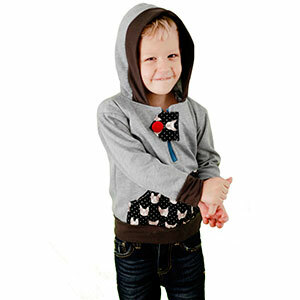 The EXPLORER HOODIE is a unisex pattern for kids. This hoodie has a half zipper or angled zipper option. This pattern is designed for knit fabric but the cuffs and bands can be made with wovens. Add a ruffle on the hood for a girly hoodie! Instructions included for elastic hem and cuffs. This pattern comes with sizes 12 months through 10 years. This is a confident beginner/intermediate level sewing pattern. Suggested fabrics are knits with at least 30% stretch such as cotton jersey, cotton lycra, french terry, sweatshirt or ponte de roma. This is a PDF pattern you can print at home on 8.5" x 11" or A4 paper. 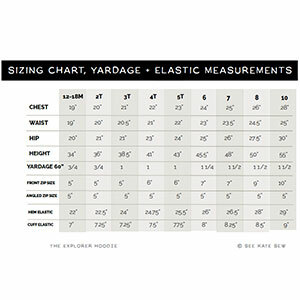 There is a 3 download limit per purchase so please remember to save your patterns.